What is your favorite flavor of ice cream? I like pretty much all flavors, and it usually depends on where my ice cream is from, but I consistently love coffee and mint chocolate chip- not together, of course! Cookie dough has never really been my favorite flavor. It’s good, but it has always seemed a little bit boring. .. you know, normal vanilla ice cream with a cookie dough bite here and there. 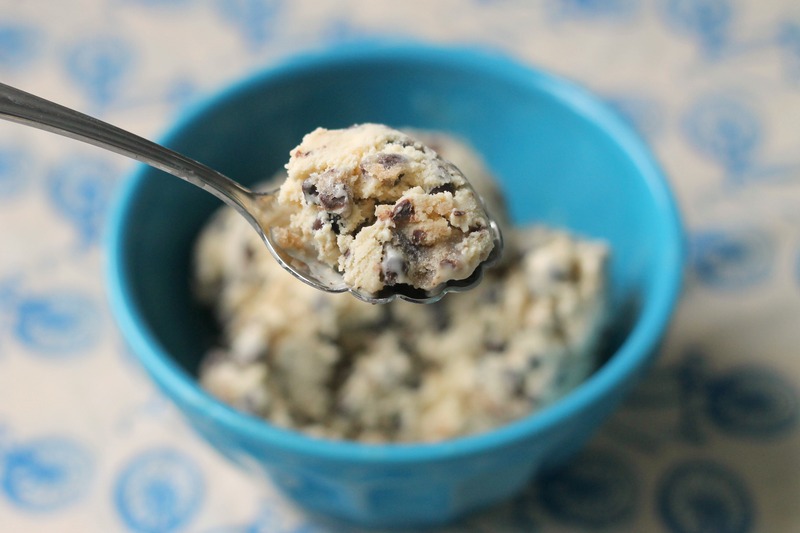 Well, this cookie dough ice cream is as far as you can get from bland! What you are looking at right now is a brown sugar, brown butter ice cream (that tastes like cookie dough) studded with chocolate chips and chunks of eggless cookie dough. It’s a pretty fabulous combination, particularly the ice cream itself. Brown butter is to die for, so it’s no surprise that this ice cream is as well. Next time (there will most definitely be a next time) I might reduce the chocolate chips, because there were a few too many, even for me (although if you are a chocolate chip fanatic, go right ahead and use the full amount!). If you are looking for a recipe that screams summer, this is it! –Capogiro Gelato (Philadelphia)- ranked #1 in the world by National Geographic. Yes, it is really that good! Cappuccino is good, as are Bourbon Butterscotch and Dark Chocolate (not sure what the official Italian names are). Well worth the $4.75 cost for a small scoop. –Humphry Slocombe (San Francisco)- the Pistachio Brittle flavor here was marvelous, but you really cannot go wrong. My aunt says that their olive oil ice cream is really good- it sounds intriguing! –Annapolis Ice Cream Company (Annapolis, MD)- This is a great, classic ice cream parlor. They have lots of delicious and fresh flavors! –Sundae Best Ice Cream Parlor (Avalon, NJ)- Our family has vacationed in Avalon, and this is our favorite place to get ice cream there. They have lots of fun flavors as well as classics. –Penn State Creamery (State College, PA)- Death by Chocolate is always a solid choice here. August Pie is another favorite-so good! Our relatives kindly brought a freezer bag full of Penn State’s ice cream all the way, for many hours, to a family gathering. We were thrilled! –Island Creamery (Chincoteague Island, VA)- They make their own waffle cones-enough said! The ice cream is great as well. In a small bowl, combine the butter and the sugar. Stir until smooth. Add the vanilla. Mix in the flour and the chocolate chips. It will be a little on the soft side, but it will firm up in the fridge. Wrap the dough with plastic wrap, and chill in the fridge until firm. In a saucepan over medium-high heat, melt the butter and continue to cook, whisking constantly, until it turns golden brown. Whisk in the heavy cream and heat until the mixture is simmering. Meanwhile, whisk the egg yolks and the sugar together into a medium, heatproof bowl until lightened in color and fluffy. Once the cream mixture is ready, pour a little bit of it into the egg yolks and whisk constantly. Slowly add the rest of the cream mixture, being sure to mix constantly. You don’t want scrambled eggs! Add the salt. Return the mixture to the saucepan and heat until it is slightly thickened and registers 170-175 degress F on an instant-read thermometer. Remove from the heat and strain through a fine-mesh sieve into a medium bowl. Stir in the vanilla extract and the whole milk. Cover tightly and refrigerate until thoroughly chilled. We usually chill overnight. Once the mixture is ready, freeze in an ice cream maker according to the manufacturer’s instructions. Meanwhile, cut the cookie dough into small chunks. When the ice cream is almost ready, pour in the chocolate chips. Once the ice cream is finished, transfer to an airtight container and stir in the chunks of cookie dough. Put into the freezer until firm, at least 4 hours. Enjoy! Oh my goodness, I LOVE cookie dough ice cream. I do feel the same way about it being just plain vanilla ice cream with chunks of cookie dough in it…it makes me just want to pick out the cookie dough and leave the ice cream. This version seems like a serious upgrade, I need to go get an ice cream maker so I can try it! I am definitely guilty of trying to pick around the ice cream for all of the cookie dough chunks!! By the way, an ice cream maker will change your life- not only is homemade ice cream fun to make, but it tastes awesome too! 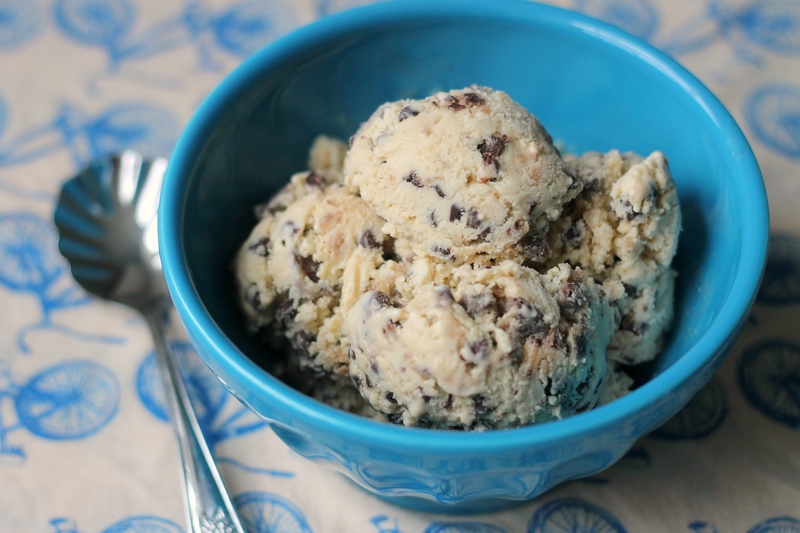 Like you girls, I’m not a huge fan of cookie dough ice cream, but this looks fabulous! I’m going to the creamery tomorrow morning to stock up for your visit, any flavor requests?? That’s really nice of you! We are so excited to see all of you. As far as flavors, we like anything really, but our mom showed us the link that you emailed us, and we thought that Berkey brickle, peachy Paterno, and black raspberry all sounded good. Get whatever Sarah, Gabby, and Mia would like though, because all ice cream from the creamery is amazing. Thank you! !